Q: I am logged into GolfBC, but can't check my points online. A: The GolfBC website, at this time, is not integrated with the Rewards Program online system. You will need to set up a separate profile and log in again by following the instructions on this page. You can also email us for a points update, to [email protected]. Q: Has the redemption changed? Q: Has the accumulation changed? A: No. 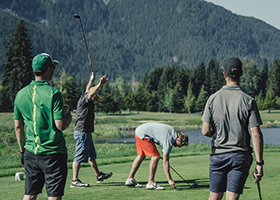 You will still earn one point for every one dollar spent at all participating GolfBC golf courses, as well as the Crystal Lodge in Whistler. Q: Do the cards come with points? A: No. The cards are FREE and do not come preloaded with points. Cards can be used immediately to start earning points. Q: Why do I need to fill out my personal information? A: In order to protect your card, you need to register your card by filling out your personal information. Should you lose your card, this will allow us to find your information and transfer your points to a new card. We will not sell our list to outside sources, but do require your email address to be able to contact you with program updates as well as specials and promotions throughout the season. Do you have a question we have not addressed? Please send it to us. Questions will be answered by email the following business day. Cardholders - Make sure we have your up to date email address, so you don't miss out on any notices or specials that are sent out by email. To update your account or if you have any questions, please email us at [email protected].